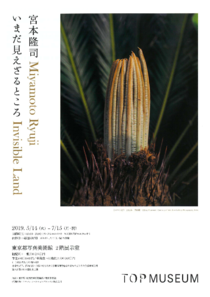 The Tokyo Photographic Art Museum will open a retrospective exhibition of Miyamoto Ryūji, who continues to have exhibitions both inside and outside of Japan. Miyamoto Ryūji has become widely recognized from his works "Architectural Apocalypse" and "Kowloon Walled City," in which he photographed urban transformation and scenes of decay from his own perspective. In recent years, he has shown new work from an art project that he planned and executed in his parents’ hometown of Tokunoshima in the Amami Islands. For this exhibition, we will display his early photographs from travels through remote regions and cities in Asia, as well as pinhole works that he has produced in Tokunoshima. Even though Miyamoto certainly went to these places and saw them, he does not know to what extent he can see them, and so he is showing us people and places that are still unseen. Born in Tokyo. Graduated from the graphic design department at Tama Art University. He worked in the editorial department for architecture magazines, and in 1975 he began to work as an independent photographer. He has received high praise for "Architectural Apocalypse," in which he photographed demolition sites (1986), and for "Kowloon Walled City," the photography of a high-rise slum in Hong Kong (1988). In 1989, he received the 14th Kimura Ihee Photography Award. In 1996, he participated in the 6th Architectural Exhibition of the Venice Biennale, and received the Golden Lion Award for his exhibition of photography taken of buildings that were destroyed in the Great Hanshin-Awaji Earthquake. In 2004, he had a one-man exhibition at the Setagaya Art Museum, and he has shown work in many group exhibitions domestically and abroad. In 2005, he received the 55th Minister of Education Award for Fine Arts, and in 2012, he received the Purple Ribbon Medal from the Japanese Government. □ With the Special cooperation of Canon Marketing Japan Inc.